Welcome to Antler Boost Blinds! Our idea of a perfect blind came from many years experience working with thousands of hunting properties all over the United States installing high quality blinds and setting up food plots for customers like you. 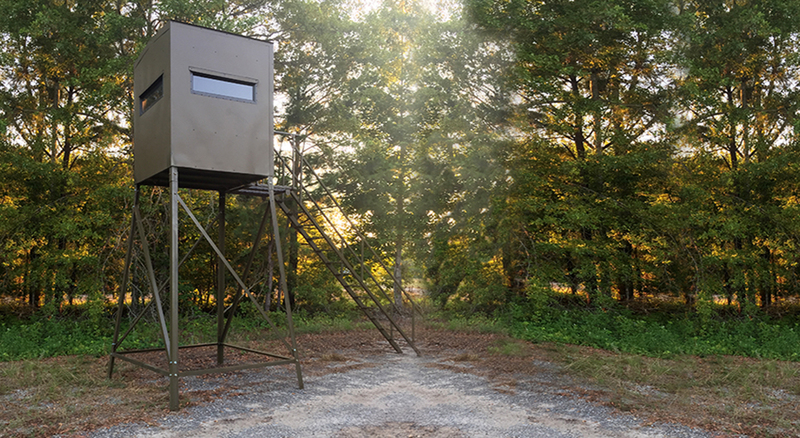 We listened to our customers and incorporated all of their ideas, wants, and needs in a blind into the Antler Boost blinds you will find here. We were not just a manufacturing company that decided to start building and selling blinds – our learning experience was in the field working to meet the demands of deer hunters and deer managers. That’s what sets us apart. Every Antler Boost Blind is made from steel and metal. You will find no fiberglass or plastic materials in our blinds and that’s for two very important reasons – maximum performance and maximum life from your investment. No fading, cracking, peeling, of the box and superior strength and stability out of the steel tower and staircase. Antler Boost Blinds come with a 20 year manufacturer’s warranty – that is serious belief in the quality of construction. Check out our 5x5 and 5x7 models. Both come with options of Ground, 6-foot tower, 10-foot tower (pictured on this page), or 16-foot tower. Tower blinds support the box in all four corners and have dual handrail staircases – no wobbling when entering into the blind and no angled ladder climbing to get into your blind. Safety and comfort are priority #1 at Antler Boost Blinds. Please call us for pricing at 888-917-4637 or help locating the closest dealer. Thanks for stopping by and we hope you BOOST your hunting experience by choosing an Antler Boost Blind!